Sooner rather than later it's going to be December and Christmas is going to be around the corner. I thought i would help you out by getting together some presents that are under £15 for men and women. Below is a bit more about them and where you can find them! Sound Asleep iMusic Pillow - £14.95: My brother who is 19 is constantly listening to music and for Christmas last year my mum actually got him the Sound Asleep iMusic Pillow and he loves it. You can just plug your phone into the pillow and as you try and sleep music will play from it. This is probably more for the younger generation, but if you know someone who loves to fall asleep listening to music, but hates waking up with the headphones wrapped around their neck, then this is the present for them, and it's only £14.99! Beer Pong - £6.99: Most men are known to love a beer, so why not get them Beer Pong for Christmas. It's a fun game that can be played with friends and family who are old enough. Even if you just wanted to have some fun and not have any alcohol, you could play with some non alcoholic drinks in there, or even leave them empty. I love playing Beer Pong as i think it can just be so much fun! ASOS Tie Bar and Cufflink Set - £10: This Tie Bar and Cufflink matching set will make a great present to any man. They've got a silver tone finish and i think they look really snazzy. I know my dad would love something like this for Christmas. Gentleman's Buff & Shine Shoe Polishing Kit - £14.99: Majority of men are always really proud of what shoes they have on, i know loads who are always complaining that they're shoes are dirty or scuffed. This would be a great gift as a Buff & Shine Shoe Polishing Kit so that they can make all their shoe worries disappear. Baylis and Harding Mens Skin Spa Noir 5 Piece Book - £7.50: This gift comes with a book that gives you a step by step grooming process and also come with 5 products too. The products are Hair & Body Wash, Soap, Shower Gel, Aftershave Balm and a Face Cloth. I think that's pretty good for £7.50 as it will someone a great range of things to use. Magical Unicorn Mug - £12.99: Most girls, young and older seem to love unicorns. Don't get me wrong i love something that's got a pretty unicorn on it, and if you do too, i think you'll love the Unicorn Mug that i found. You can drink your tea or coffee or whatever you like to drink, and look awesome as you'll have a unicorn on the mug! Really Good Bright Side Money Tin - £2.50: Most women, when it comes to their time of the month are craving chocolate, i know for sure that i am. 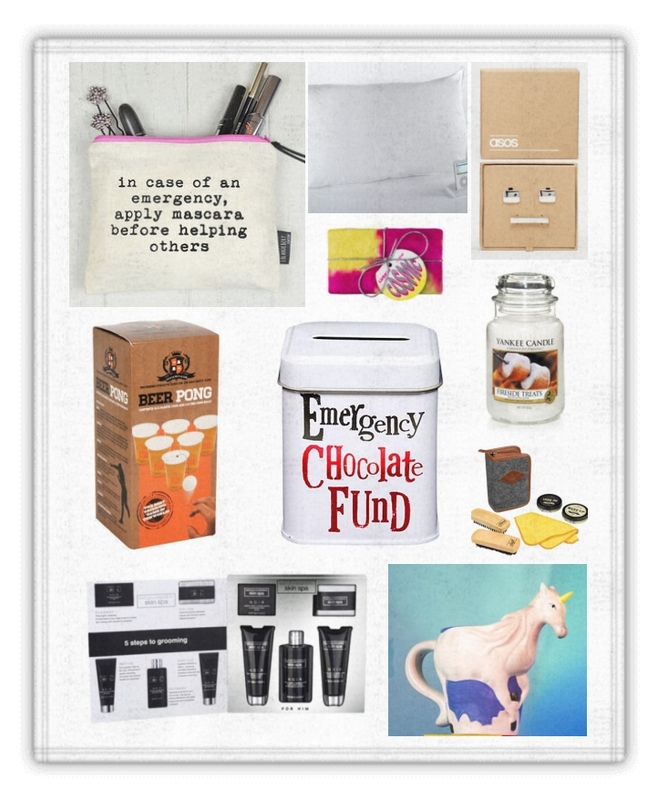 So why not use this money tin that has the words 'Emergency Chocolate Fund' written on it, to save a bit of money for when you are desperate for some chocolate, or whatever takes your fancy. For £2.50 you can't really go wrong! LUSH Cosmic Gift Set - £9.25: Something from LUSH is an amazing Christmas present, and i've found this gift set that they do for under £10. Inside you get the Twilight Bath Bomb and the Rockstar Soap, which i can imagine smells amazing as most things from LUSH usually do. The gift set is wrapped in a lovely paper with a colour mix or yellow and pink which i think looks wicked! In Case Of Emergency Apply Mascara Make Up Bag - £14.50: I thought the make-up bag would make a great present for any age women. The bag says 'In Case of Emergency, Apply Mascara Before Helping Others' which i think is really fun. Make-up bags with fun little quotes like this on are such a nice detail, very Instagram worthy too! Fireside Treats Large Yankee Candle - £14.99: I actually have this Yankee Candle burning in the room i'm sitting in right now. It smells divine! Yankee Candles are usually quite expensive but i think they are definitely worth their money as they make your room smell incredible in only a few minutes! I've managed to find this candle in a large for just under £15 so i'd definitely go and grab this if you like the smell of toasting marshmallows! I hope you liked this Christmas Gifts Under £15 post! I really hope it helps you in choosing a cheap present for a friend or family but still great quality!